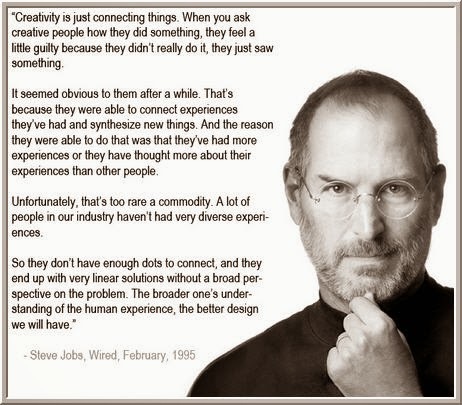 Steve Jobs made a great point: We're more likely to connect the dots and perceive new relationships among things if we have more dots to connect. Having more and different experiences provides a richer palette from which you can paint the world. Research suggests that there is value in cultivating experiences that are outside our routines--and even downright weird. It is the unusual experience that is most likely to give us new dots to connect. Last year I took on a psychology research project that was out of my wheelhouse. The project forced me to learn data analysis techniques that I had never before utilized and got me looking at data in wholly new ways. I was totally overwhelmed, then I was fascinated. I learned a tremendous amount and what I learned has provided the backbone for my most recent modeling of equity index price movement. At the time I took on the project, I had no idea that it could be relevant for markets, but the fresh dots led to novel connections. The key is that involvement in diversifying activities has to be active, not vicarious, to generate enhanced cognitive flexibility. Listening to new and interesting music can be stimulating; tackling the playing of a musical instrument can be diversifying. We can read about different cultures, but it's visiting them that provides us with a different view of our own ways of life. There is much to be said for process and routine in trading, but it's the experiences beyond the routine that provide us with the cognitive flexibility to see markets from different angles and adapt quickly when markets shift. Stubbornness in trading is really a form of cognitive rigidity. It's difficult to believe we can be flexible traders while living inflexible lives.